The amount of time people in Wales spent watching broadcast television fell for a fifth consecutive year, research from Ofcom finds. In 2017, viewers in Wales spent a daily average of 3 hours 43 minutes watching broadcast television. Although viewing time remains above the UK average (3 hours and 23 minutes), it is down by 17 minutes (-7%) since 2016, and by 48 minutes (-17%) compared with 2010. The decline is even steeper among children and viewers aged 16 to 34 in Wales, whose broadcast television viewing on the TV set has almost halved in recent years. In 2017, youngsters aged 4 to 15 watched 1 hour and 31 minutes of broadcast TV each day, down from 1 hour and 51 minutes in 2010 (-47%). Similarly, viewing declined among people aged 16 to 34 from 2 hours 27 minutes in 2010 to 1 hour 57 minutes in 2017 (-43%). The changes mean that the over-55s in Wales watched almost four times as much broadcast television per day than children last year. The findings are part of Ofcom’s Media Nations: Wales 2018 report (PDF, 4.3 MB), a comprehensive study of trends in the television, radio and audio sectors, published today. Although people in Wales are watching less broadcast television, they are they are spending more time watching other things on their TV set. Daily viewing of non-broadcast content, such as YouTube and subscription on-demand services including Netflix and Amazon Prime Video, increased by 11 minutes (33%) in 2017, to 44 minutes. A third of adults in Wales (33%) now claim to use online subscription streaming services such as Netflix and Amazon Prime Video. However, BBC iPlayer is the most popular of all streaming services (used by 37% of adults), followed by Netflix (25%) and ITV Hub (24%). Jonathan Rose, Acting Director of Ofcom Wales, said: “This research shows that the way people in Wales watch TV is changing fast. “Welsh viewers are spending less time watching ‘traditional’ broadcast TV, and are increasingly turning to online streaming services, attracted by their exclusive programmes and vast libraries of classic shows. 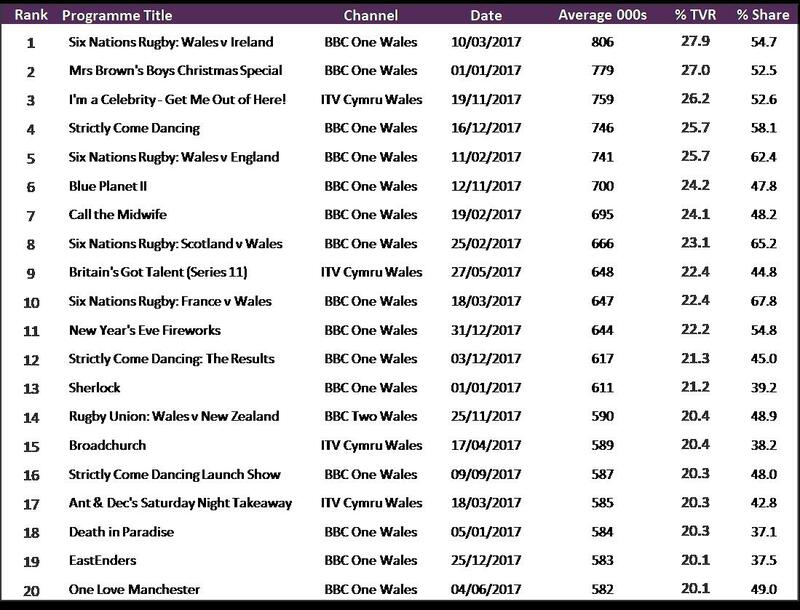 In a typical week in 2017, 364,000 viewers in Wales watched S4C on television for at least three consecutive minutes – the highest level of reach since 2014. Digital radio listening in Wales, either online through digital television or through a DAB set), increased to 47%, slightly lower than the UK average (51%) and in line with listening in Scotland. Source: BARB. BBC areas, all individuals (4+). The TVR (television rating) is the measure of the popularity of a programme, daypart, commercial break or advertisement by comparing its audience to the population as a whole. One TVR is numerically equivalent to one per cent of a target audience.